The last of yesterday’s snow will move offshore in the next couple hours, and the storm system’s cloud cover won’t be far behind. Little to no additional accumulation is expected from flakes this morning. Most if not all of the region should see sunshine by the afternoon hours. Temps will be on the chillier side in the wake of the system, ranging from 10 in the north to 25 in the south. Today will feature colder temps but thankfully calmer winds as high pressure gets a bit closer to the area. NW winds will still be breezy, but not nearly as destructive as yesterday. Even a lighter NW flow will bring us an upslope/downslope pattern so expect clearing skies along the coast while flurries and overcast conditions continue up in the mountains. High temps will be on the chillier side, ranging from around 0 in the north to around 20 in the south. Today will feature falling temps as strong winds usher in cold air from the northwest. Snow squalls have been in progress this morning on the leading edge of that cold air, but as the day goes on expect any precipitation to be more confined to the typical upslope areas. The main story today though will be the wind, but by this point you probably didn’t need me to tell you that. Here’s the NWS’s forecast for wind gusts today, and as you can see the majority of us will get above 50 mph at least once or twice. The strongest winds are of course up in the higher elevations, so maybe put the hiking and skiing on hold for today. 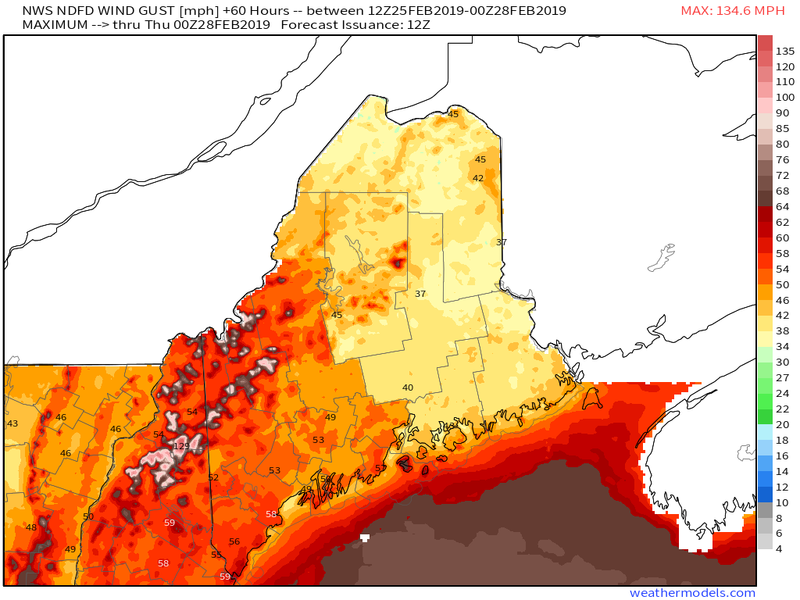 If you’re curious, Mount Washington has already gusted to 144mph and the Observatory is forecasting gusts up to 165 mph. That’s the equivalent of what you’d find in some of the strongest hurricanes ever to make landfall! Winds die down tonight with seasonably chilly temps. Our next storm system is here today, and it will be another messy one. Snow is already falling now across the southwestern half of the region, and northeastern areas won’t be far behind. Snow will change over to rain along the immediate coast today, with an icy mix developing over southern NH. The ME mountains should remain mostly or entirely snow, with accumulations of 6-10″ expected. Amounts taper off the farther southeast you go. Precip wraps up from west to east later tonight. High temps today will range from 30 in the north to 40 in the south. Today will feature more quiet weather as high pressure builds overhead. Look for partly to mostly sunny skies with dry conditions and light winds. Temps will range from 25 in the north to 40 in the south. It’s a great day to head for the slopes, where there’s plenty of snow from all the recent storms! Our next storm arrives tomorrow with a mix of rain, sleet, ice, and snow. Today will feature another day of calm weather before our next storm system arrives tomorrow night. Winds will be light out of the northwest, meaning a mix of sun and clouds for the mountains and mainly sunny skies along the coast. Temps in the mountains will get into the mid 20’s, while highs could touch 40 along the coast. No precip is expected as a large area of high pressure establishes control of the region’s weather. We’re headed back to the upslope/downslope pattern today as our latest storm system departs off to the east. Clouds will stick around in the mountains along with upslope snow showers and temps in the low 30’s. Down along the coastal plain, precip ends quickly this morning with breaks of sun emerging by this afternoon. Temps downwind of the mountains will rise dramatically into the low to mid 40’s. Our next storm arrives with more snow and mixed precip this weekend.